What is Italian food? You probably think you know. I thought I knew too. Italian food is about fresh! Fresh in this sense means two things, regional and seasonal. So each region of Italy would traditionally have its own cuisine that would shift based on the time of year. Whatever could be gotten local and fresh at that time of year would be used. 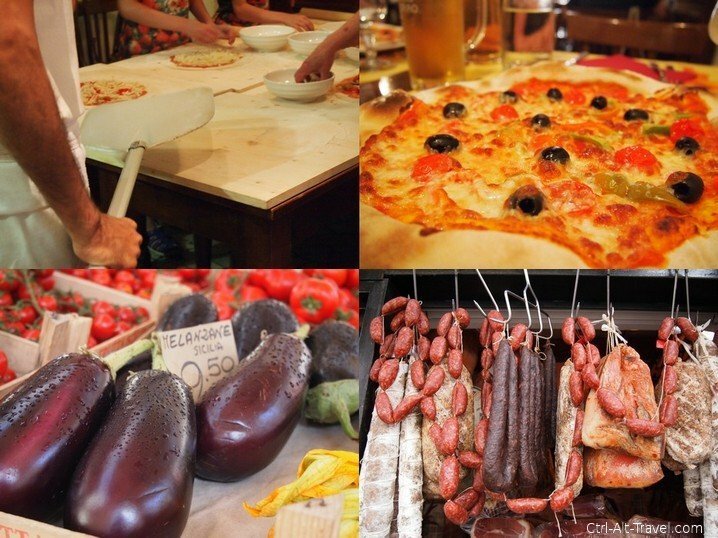 Add a layer of preserving food in the winter and that is what we learned Italian food is on our tour of food in Rome. This tour was my favorite part of our week in Rome. We went into the tour not really knowing much about it. 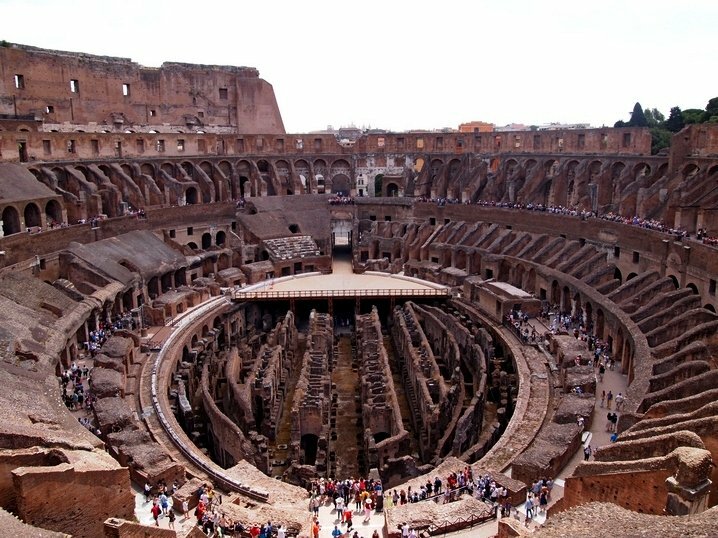 We had been on the tours of the Colosseum and Vatican with Walks of Italy and they asked if we wanted to do this one as well. I am so glad we said yes. It was a fantastic tour and a wonderful look at a less touristy aspect of the city. Markets are my favorite part of travel. I love the sense of life, the cheap food stalls, the sights and colors. And a good one will feel more local than touristy. Campo Fiori in Rome is where the tour started and fulfilled most of these. It is a few blocks from Piazza Navona and definitely ringed with restaurants catering to tourists, and yet it had the market feel that I like. 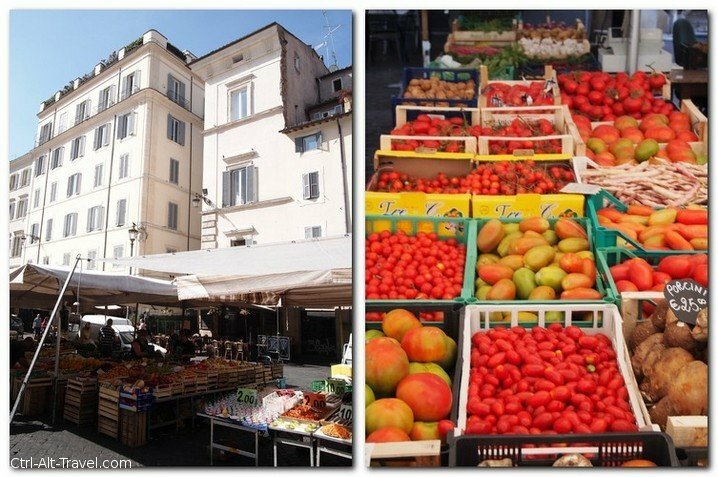 After some history of the square and the aforementioned lecture about Italian food being fresh, regional and seasonal, we wandered the market. Tomato is a summer food and were out in so many varieties. And although apples are a fall food, they were out as well. The modern ties have brought imported food to Italy as well. Things are shipped from various parts of the country to others. Certain things are available all year round. Times change apparently even here. Our first tasting stop was a stand of oil and vinegar. 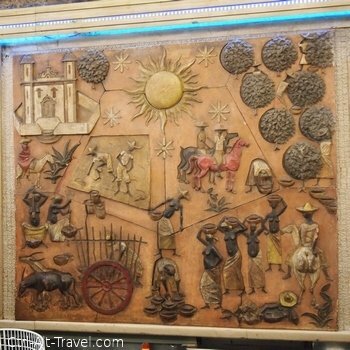 The animated woman who owned the stalls waved her hands while talking in classic Italian fashion. Signs everywhere said that trying things was encouraged. Our guide handed us bits of bread and started talking about olive oil. We learned that the climate and ground type affects the olives and thus the oil (again with the regional thing). 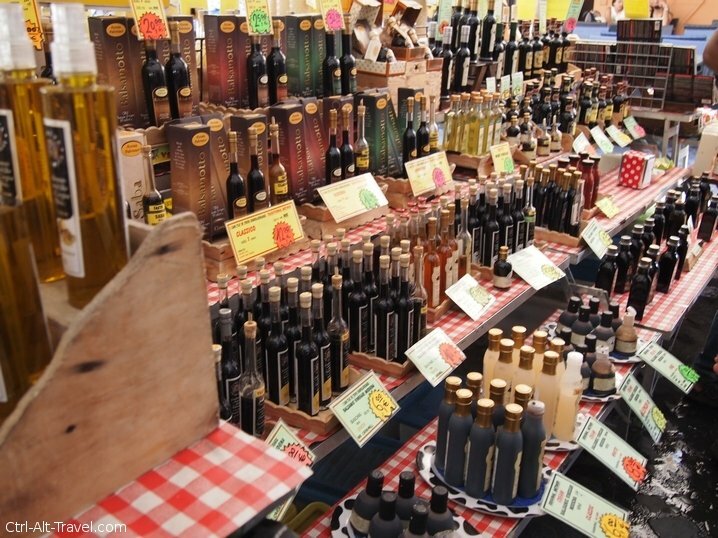 That Extra Virgin Olive Oil is for salads and direct eating, while stuff just called Olive Oil is better for cooking. The process for the second allows it to work better at high heat. This was all kind of fascinating. And yet, despite all of our guide’s enthusiasm, I really couldn’t taste any different. Oil on bread in my mouth is oil on bread. The vinegar was a different story. In the same stall on opposite the oil was a display of balsamic vinegar. This was a great tasting for me. There are several ways to make it: a traditional process (which we learned about in Modena) and an Original Process. Here I could taste the difference. The original was sweeter and tastier to me even at the low end of prices. They even had vinegar cremes where extra flavors are added. In comparison to the ultra pure traditional process, I liked the whimsy of the differences. A quick stop at a stall to taste spreads (which I was not so impressed with) and we hit up the lemoncello stand. Alcohol before noon? With only a bit of bread and some oil and vinegar in my stomach? Sure, sounds fine. In fact, it was quick good. We had had some really strong stuff in our travels and yet this was softer. It tasted more of lemons and less of just pure alcohol. Like the vinegar’s there were a number of other flavors. We spied a chocolate chili one. As the rest of the group was moving away, Ali and I shared a sample of it. We ended up buying a bottle later. Very thick, but a nice flavor. Our next stop was a store hung with meat. Especially given the tradition of regional and seasonal food, preservation was important to be able to eat all year. So this fit. The shop is called Antica Norcineria Viola and right on Campo di Fiori. We eve went back a few days later for some snacks for the train home. Germany is thought of as the land of sausage. 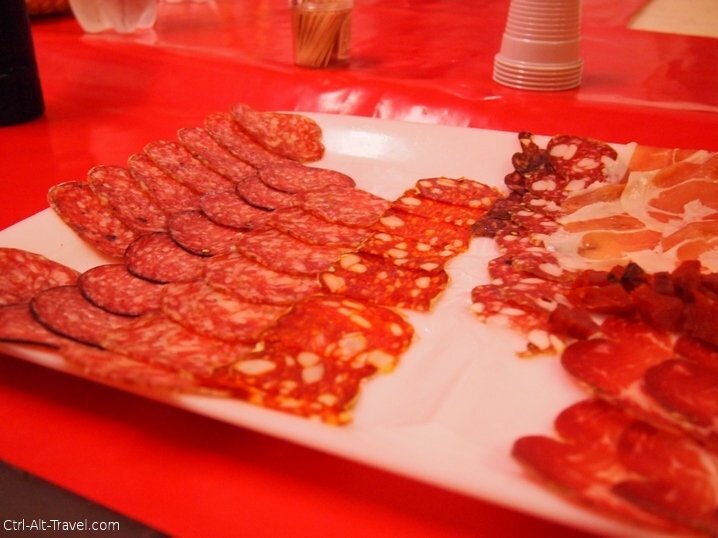 Especially in the realm of salami, Italy will give Germany a good run for its money. Hams to the left, salami to the right, and all manner of other meat products about. We were led to the back where a nicely laid out plate of salamis awaited us. As I was distracted by the number of knives in a row, our guide described the salami’s. By the time I turned back to the group, they had begun to dig in. The recommended line of fennel sausage was already finished. I tried a number of others, but my favorite was one made with wine. I usually think of myself as having fairly simple tastes that run to cheap. Yup, that was the most expensive on the plate. This is all pork sausage, so be aware if you happen to not eat pig. The next stop was the back of a cheese shop called “Cisternino”. With all of the different shops and the Italians shouting about, I was reminded of New York City. Each shop is a specialty place instead of our mega markets which toss everything under the same roof. The cheesemonger(?) 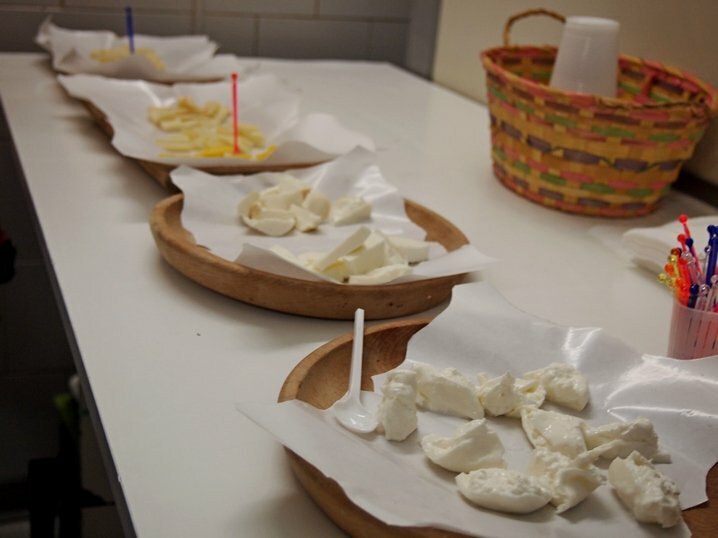 described the range of cheese and even reordered it with a indication to try from soft to hard cheese. On the softer end, I like mozzarella. The texture of the balls is nice and quite different from the shredded pizza style mozzarella from the US. It was wet and soft and yet with a fine texture on the outside which faded to nearly creme on the inside. I don’t wax poetic very often about food, but that was good. At the other end, I had quite a few pieces of the peccorino sheep’s cheese. Such a neat flavor. The other options included a saffron flavored cheese and a smoked cheese that competed well for my favorite. I had started the day worried that I could not tell the difference between the oils. Now I was happy in the cheese shop. Of course, the finale was lunch. This was in fact the only part of the tour that we knew about a head of time. Pizza making in Rome is how Ali and I talked about it during the trip. We were looking forward to it. Especially after some particularly bad pizza in Naples of all places. Again back to the regional idea of food. 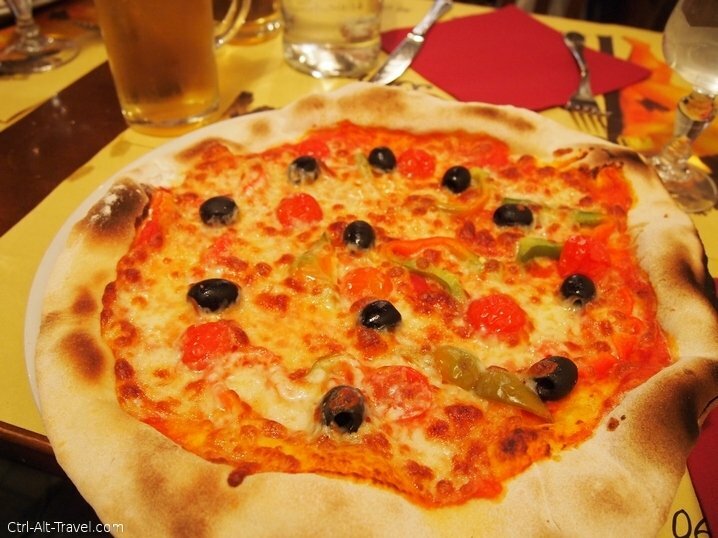 Rome pizza and Neapolitan pizza are different. Rome is a very thin crust which becomes crispy in the wood fired oven. This is not New York style (which is still the best for me), but of the Italian style’s we had tried Roman was indeed my favorite. I really like crispy. For this part of the tour, we were given each a ball of dough to roll out, a bowl of tomato sauce and various toppings to put on the pizza. It was then tossed in the oven and we sat down to enjoy lunch as a group. We learned that they put the meat on after the pizza is cooked. The ham or salami is already cooked and just needs the heat of the pizza to warm up. Let me say though, rolling pizza dough is far more difficult than it seems. It wants to stretch until it doesn’t and then it tears. Thankfully the burly man who was explaining everything and his assistant were there to fix our dough. No meal in Italy seems complete without a coffee. The tour mirrored an entire meal with appetizers of cheese and meat followed by our pizza making, so of course it would end with coffee. Here we were walked a few blocks across Piazza Navona again to an apparently quite famous coffee shop with bright yellow decor. Even though coffee is such an Italian thing, our order was not. A few ordered hot chocolate and I asked for a decaf cafe. The interesting part of the cafe for me was that they sweeten the coffee for you. No little packets of sugar unless you explicitly order it unsweetened. I am not a big coffee drinker, but it was pretty good, their sweetening job. We stood, in classic Italian cafe style, discussing social media impacts on the world. This topic from our guide who was studying such things and headed off to New York soon. So it wasn’t just about good eating, but interesting discussions as well. I hadn’t anticipated that. What did I think of the Food Tour? Yes, we were guests of Walks of Italy on this tour, but it really was wonderful. The price (59Euros at time of writing) included tastings and lunch including a drink and the coffee afterwards. The group was not very big (under 12 is their mantra), so felt more intimate. This is where the company shines for me. The small groups with interesting local style view into Italy. The big tours of the famous places are still nice with a smaller group, but this was my favorite few hours. I would totally recommend this tour to anyone coming to Rome. Check out Ali’s perspective of the tour. Do you need a disclaimer? Ok, opinions are my own. I would written the same review had we paid.